Contains: Ceratium horridum, Ceratium tripos. 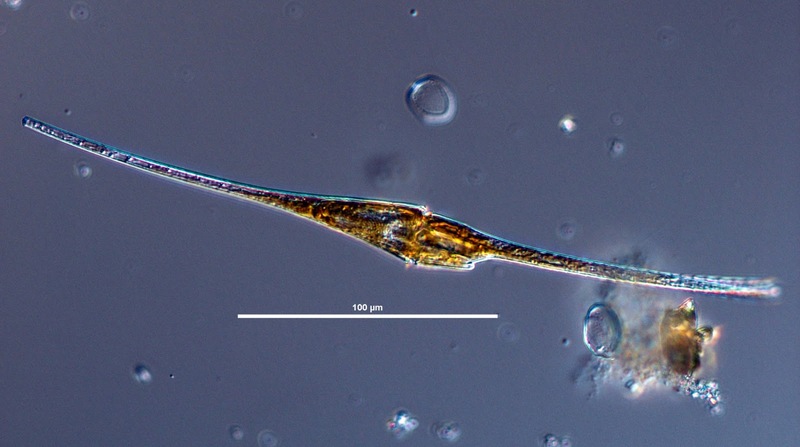 Ceratium is a diverse genus of flagellates, including both freshwater and marine species, with three or four horns radiating from the theca. Characters (from Steidinger & Williams 1970): Theca with 3–4 horns, 1 apical, 2 to 3 antapical, 1 sometimes rudimentary. Some species with spatula-like epitheca and no apical horn. Plate formula: 4', 5'', 5''' and 2''''. Chloroplasts present. Obvious thecate ventral area composed of 4 plates occupying at least 2/3rds of midbody's ventral surface. [FT93] Fensome, R. A., F. J. R. Taylor, G. Norris, W. A. S. Sarjeant, D. I. Wharton & G. L. Williams. 1993. A classification of living and fossil dinoflagellates. Micropaleontology Special Publication 7: i–viii, 1–351. [LO03] Lee, J. J., R. Olea, M. Cevasco, X. Pochon, M. Correia, M. Shpigel & J. Pawlowski. 2003. 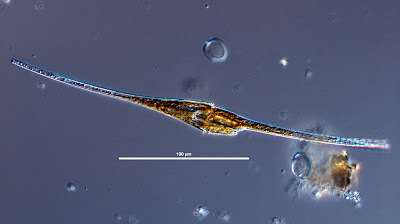 A marine dinoflagellate, Amphidinium eilatiensis n. sp., from the benthos of a mariculture sedimentation pond in Eilat, Israel. 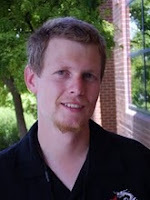 Journal of Eukaryotic Microbiology 50 (6): 439–448. [S73] Sournia, A. 1973. Catalogue des espèces et taxons infraspécifiques de Dinoflagellés marins actuels publiés depuis la révision de J. Schiller. I. Dinoflagellés libres. Beihefte zur Nova Hedwigia 48: 1–92. [SW70] Steidinger, K. A., & J. Williams. 1970. Dinoflagellates. Memoirs of the Hourglass Cruises 2: 1–251.